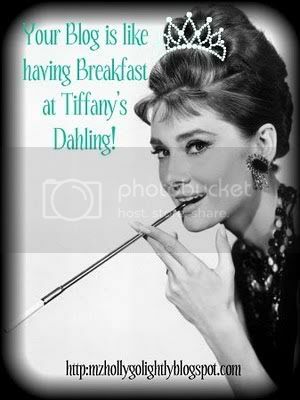 Harlean's Heyday: Breakfast at Tiffany's, dahling! Here are some of the blogs that brighten my day and make me feel like breakfast at Tiffany's, dahling! • Diamond Stash - She defines the word 'style' to me. Plus, Fiona's incredibly sweet too! • Tea with the Vintage Baroness - This lady rocks 1930s looks like no other. Very inspiring! • The Call of the Jitterbug Doll - Modern day Betty Grable with impeccable style and the most incredible hairdos. • The Vintage Lesbian Project - Gotta appreciate a vintage loving lesbian who embraces her curves. • Va-Voom Vintage - A great blog with plenty of tutorials and inspiration, especially for us voloptuous ladies. It's a lovely blog you deserve it. Cheri Pinktrix - Glad to hear that! I'm a big fan of your blog, even though I'm kind of bad at leaving comments. That's cool, I don't leave a ton of comments either. Not that it's connected, but as it so happens I just saw HIM live in concert so I was learning a bit about Finland. I think it is very interesting! Cheri Pinktrix - Hehe, that's so funny! I'm really sick of HIM myself, to be honest. They're MASSIVE in here and have been for well over a decade.